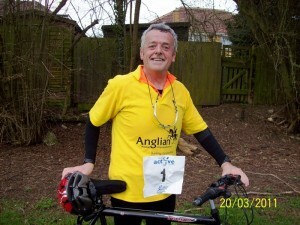 Anglian Home Improvements very own Regional Fleet Manager, Vince Hannon, recently decided to take part in a triathlon for charity. Here is his amazing story, told by the man himself. This year’s efforts were to work alongside raising much needed funds for three worthwhile charities. They are CANCER RESEARCH UK, the BRITISH HEART FOUNDATION and the KEECH COTTAGE HOSPICE in my home town of Luton. Many Thanks to Anglian Home Improvements for “starting the ball rolling” with their kind donation and to all of the Retail Operations’ Regions around the country who are collecting and donating funds to these three very worthwhile causes. Being a member of the vertically-challenged brigade at 5’ 6” and having the scales tipping 15 and a half stone [almost 100kgs] at that stage, my Body Mass Index was 35. This placed me in the “Chronically Obese” category not a good place to be. I have to say here and now that up until then I’d always had a terrible diet. I never-ever ate fruit or vegetables. It was pretty-much chips with everything, lots of red meat, crisps, sweets, Oh and beer!……I actually used to think the only Jim that existed was a shortened version of the name James. Exercise was something I did when I was younger, a thing of the past. So the journey began with what was to become a complete life-style change. I set myself what some might see as an impossible four stone overall weight loss target. I knew it wouldn’t be easy; nothing worthwhile is ever easy to achieve. Being blessed with my Mother’s fairly strong will I’ve become a bit of a mentalist and so, when my mind is put to a task, the task gets done. Out went the fast-food options and in came the correct healthy eating plan with high-carb low-fat breakfast, regular healthy “snacks” [raisins, bananas etc.] throughout the day and a healthy, vegetable-laden meal in the evenings. In came a regular exercise routine, which began with some very sedate jogs to the park and built up to actually being able to run around the park several times, with recovery becoming more rapid as the months built up and the weight came off. So, in April 2010 ideas were placed as to this year’s challenge, what could I do to really test me and give me a fresh target to work towards? A Triathlon! The date was set for 20th March 2011 and the work began with the training towards the swimming / cycling / running event ahead. I got my wife involved in the training too, it was the only way we’d actually get to spend some time together! We went spinning [a static cycle with a flywheel and varying resistance = lots of sweat !!] a couple of times a week interspersed with a few running sessions in the park and a few cycling sessions on weekends. This built up to me doing a few “bricks” with two of the three disciplines being completed back-to-back over the last few weekends. Event day’s eve, Saturday 19th March 2011, bike checked, tyres pumped, short bike ride to make sure the legs were OK, kit packed, all loaded into the motor ready for the morning. Sunday 20th March 2011, up at 5.45am, three weetibix with fruit and low-fat yogurt, shower and off to the Leisure Centre for Registration at 6.45am and into the water at 7.35am for 16 lengths of the 25m pool. Out, dry off and quick change into the cycling gear before heading out for a gentle 20km cycle ride [which was downhill out = uphill back and against the wind] back to transition before dismount onto jelly legs and off on the “run” [which was 2.5km downhill out = 2.5km uphill back!] to the finish. Exhiliration? You bet!!! The end of another journey, literally, and at 53 years of age too! Where to next? Who knows? Is anything impossible? Christopher Reeve [the paralysed Superman actor] said nothing was! Henry Ford said, whether you think you can or you think you can’t, you’re right! Thanks for reading my recent history and I hope it may give you the “spur” that you need to achieve your own goals. Oh Yes, nearly forgot, as for the 38” waist trousers, I now wear 32” and so the wardrobe has changed completely, for the better! If you would like to donate to Vince for his hard work on not only losing weight, but on his completion of the triathlon here are the links to his selected charities. Anglian kindly donated £300 to Vince, £100 going to each charity. 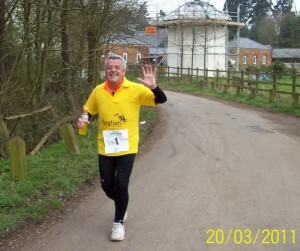 Vince has managed to raise a staggering £800! (So far)! 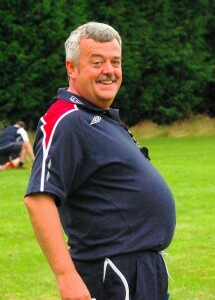 Well done Vince on your outstanding effort. Anglian Home Improvements supporting communities and charities across the country. Visit the Anglian website for information on our home improvement products.